As I was preparing our lunch the other day, I realized I didn’t have any vegetable dish to partner with my breaded pork chop. I checked my pantry to see what was available and I was able to come up with a healthy salad using a can of Century Tuna Flakes in Vegetable Oil (drain oil), a can of Del Monte Corn Kernels, sliced tomatoes and onions, vinaigrette dressing, 2 pieces of calamansi (local lemon), and salt & pepper. I combined everything and voila! 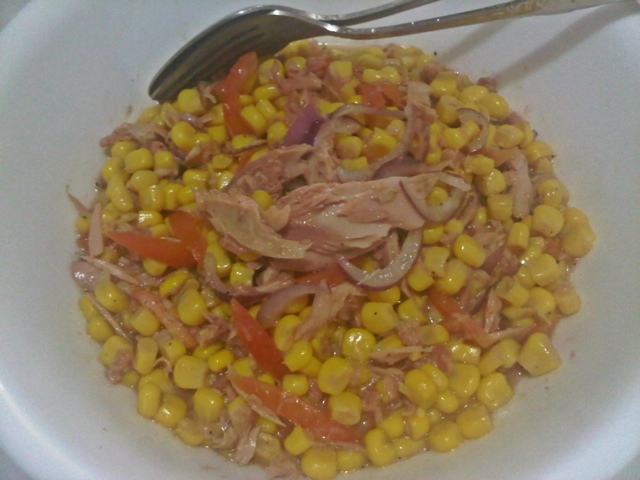 My very own healthy Corned Tuna Salad in Vinaigrette Dressing! yes! really voila for a meal, not only healthy but quick! ‘will try this soon as all the ingredients are on stock always. cheers!